An all glass tea infuser water bottle with a natural bamboo lid. Includes a protective carrying sleeve, and stainless steel tea infuser. The Copenhagen is a double-walled glass infuser water bottle. It has a natural bamboo lid, and a stainless steel tea infuser. The Copenhagen glass tea infuser bottle is double walled. So it insulates your tea or infused water keeping it hot or cold much longer. It has a capacity of 425 ml or 14.3 fl. oz. The Copenhagen fruit and tea infuser water bottle is made of borosilicate glass. But unlike similar looking bottles we heat treat our glass bottle for extra durability and heat resistance. So while it is glass, it is one of the most durable bottles of its style that you could buy. This extra step of heat treating and cooling the glass over one to two days is called annealing. Annealing of the glass in special furnaces ensures the most durable and safe water bottle possible. This bottle is safe for use with boiling hot water. And it is more durable than similar looking bottles and safer as well. This is due to the special “annealing” process that our glass bottles go through. We designed the stainless steel infuser to separate into two pieces. The longer part of the infuser detaches from the top basket. You can use the long infuser for steeping loose leaf tea. The smaller basket infuser can be used by itself for infusing fruit, tea bags, or blooming teas. Or, remove the strainer altogether and it becomes insulated water bottle. Two-part tea infuser: We know tea and water infusion. So we have designed this infuser to be the perfect size for infusing tea. That will give your loose teas room to expand. You can easily use it for fruit as well. You can also put fruits and herbs directly into the bottle and use the small strainer to make infused water. The Copenhagen has a natural renewable bamboo lid with a stainless steel interior. It has no plastic that will touch your hot beverage. Since it is a double walled insulated glass tea infuser bottle, the tea stays warm much longer. Also, it includes a neoprene sleeve that protects your steeped tea or infused water. This further insulates your hot or cold beverage.The neoprene sleeve also protects your bottle against accidental knocks on the table our counter. 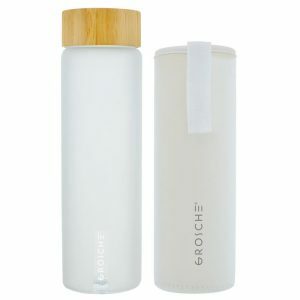 You should use the included sleeve as additional protection for this double walled glass bottle. The Copenhagen infusion bottle is quite flexible to use. You can use it to make loose leaf tea. Or, simply add in some cut fruit into the bottle, and use the small screen to enjoy fruit infused water. The protective neoprene sleeve insulates and protects the bottle. 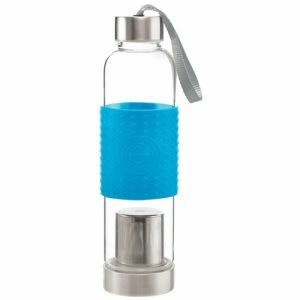 The Copenhagen is a very easy to use glass infuser water bottle. Simply add in your tea or fruit. Then add in hot or cold water. Now your tea will infuse in the bottle. Then you can remove the infuser if you wish. Your steeped tea is now ready. You can remove the infuser if you wish.